Caminetto is very much a family brand, now with three generations of Ascortis all sharing their craft under this name. Guiseppe Ascorti, or "Peppino" to his friends, was one of the original founders of the marque and played a large role in the brand's early success. 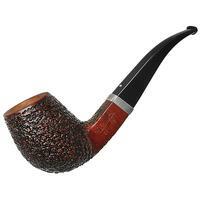 Ascorti later left Caminetto to continue his craft, but the "Pipa Del Baffo" ("the pipe with the mustache") still held a special place in the hearts of the Ascorti family. This legacy is what led Peppino's son, Roberto, to revive the old Caminetto name we know and love today. Caminetto pipes are currently made by Roberto and his son Tommaso or "Tommi" Ascorti. The workshop continues to feature many of the shapes which contributed to their spectacular success in the '70s, but recently there has also been something of a shaping/aesthetic revolution afoot. With Roberto and Tommi at the helm, Caminettos now bear either of two stamps: "AR" (Ascorti, Roberto) or "AT" (Ascorti, Tommaso). The AR line presents the work of either Roberto or Tomaso, and continues to include a fine combination of the Caminetto traditional shapes as well as many new, emerging forms. The AT line is Tommi's alone, and features edge-pushing designs which, heretofore, would have been considered quite unexpected from Caminetto. The original Caminetto marque was founded in the late '60s. After working as one of Castello's principle artisans for over ten years, Peppino branched out and created his own independent workshop. Together with Luigi Radice, who also worked for Castello, and Gianni Davoli, they founded the Caminetto brand. "I tre Camini," as the trio were later known, soon made their mark on the world of pipes and pipe tobacco, particularly in the United States where Castello pipes were in large demand but extremely scarce — playing heavily on that Italian tradition while adapting and evolving it to something very much their own. For reasons both internal and external, the end of 1979 saw the original Caminetto brand disbanded, and I tre Camini all went their separate ways.